The Year in Racist Magazine Covers | what prevents you from dancing? Whether you attribute it to the digital revolution or the financial crisis, the magazine industry ain’t as glossy as it used to be. In the first half of this year, newsstand sales in the US for prestigious magazines such as Vogue, Vanity Fair, The New Yorker and Cosmopolitan fell in the double digits. Despite declining profits, a magazine cover still has the ability to create headlines worldwide. Sadly, in desperate attempts to grab our attention and boost sales, magazine covers can also offend. Especially when it comes to race. Last month a Spanish magazine wilfully courted controversy when they decided to superimpose the face of Michelle Obama onto the body of a female slave in the 1800 painting “Portrait d’une négresse” by French artist Marie-Guillemine Benoist. Here was the First Lady, bare-breasted, stripped of her identity, voice and intellect and instead assigned to the passive role of subject and slave. The debate in the US blogosphere has raged, with many describing the cover as nothing short of blatantly racist propaganda. Understandable when one considers the enduring historical depictions and myths constructed about black women. Say goodbye to the supposedly ‘post-racial’ America in which the Obamas entered office. Alas this is not the only overtly racist cover I’ve noticed recently. Earlier this year, readers of FHM Philippines expressed outrage at a preview of a cover posted to their Facebook group. It featured a light-skinned model posing in a pink swimsuit while surrounded by darker-skinned models (later revealed to be of Filipino descent who were painted to look darker). To add to the offence the tagline read, ‘Stepping Out Of The Shadows.’ Within hours a barrage of complaints on the fan page forced the editors to pull the cover before it hit newsstands. The retraction demonstrated that when it comes to the question of racist imagery, magazine readers might have a more nuanced understanding than magazine editors. Racism in the form of cultural appropriation and Euro-centric versions of beauty are not new or unusual in the world of fashion. Just ask black cover girls about their encounters with skin lightening. This month’s Elle magazine has Rhianna gracing its cover but she looks suspiciously pale. It’s not simply matter of camera overexposure when one considers the drastic measures many women go to in order to lighten their skin. Ah, but magazine covers here in Australia aren’t so racist, right? Wrong. Already this year, the Good Weekend has delivered two covers I’ve noticed with particularly virulent, one might say, ‘retro-racist’ imagery. 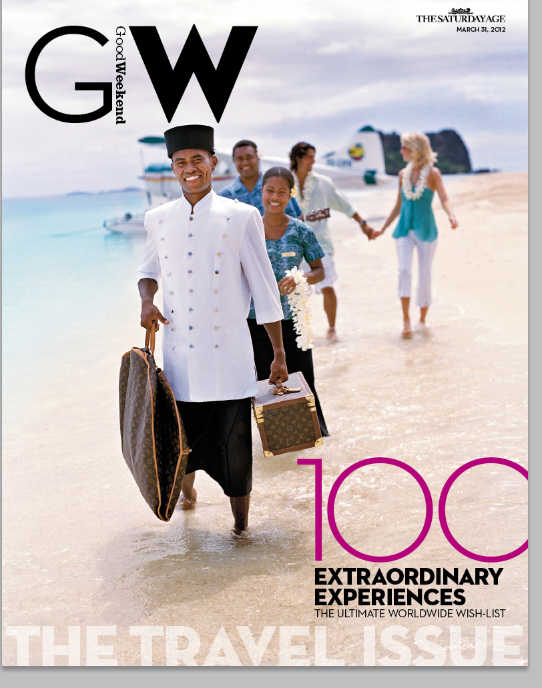 First this cover for their travel issue. Yes, I almost choked on my coffee. I could hear the mortified gasps of post-colonial theorists everywhere. The subaltern does not speak. He simply smiles and carries your luggage. At least, that is, if you’re rich and white. And then again, when running a feature on gay Arab Australians. What image captures the particular homophobia, exclusion and racism experienced if you’re gay and Arab in Australia? Of course, let’s reach for something that screams repressed sexuality and stirs up fear of the unknown: women in niqab. Oh, and please make sure they have large, mysterious eyes accentuated with heavy make up. Especially infuriating was how much the cover image contrasted with the report. Inside the magazine pages we hear from openly gay Muslims and Arabs and other community members articulately expressing their concerns. Ironically, one prominent issue they face is the racism they repeatedly encounter from both the wider gay and straight community. It’s a sad reflection that in their search for that one cover image that ‘sells’, no one in teams of dozens of journalists, editors and sub editors seems to notice that what, in fact, makes these images powerful or arresting is that they are racist. Now I know that one magazine cover alone cannot undo structural and historical racism, but it will perpetuate negative and narrow stereotypes. And the profusion and repetition of these images does straightjacket our collective imaginations – and eventually infects public policy and discourse. So much so, that even individuals and communities represented begin to internalise limited ideas about themselves. So photo editors listen up. Go ahead and select an image that offends, if in offending some of our sensibilities you also challenge social orthodoxies and nudge us towards better and different ways of thinking. But, first think it through. Consider the message you are choosing to send. Ask, is this racist? You might come up with an even more powerful cover that, in a difficult market, keeps your readers on side.